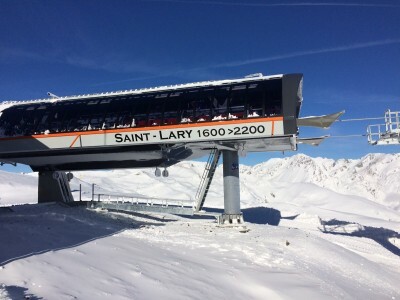 St Lary is a beautiful traditional French resort - situated high in the stunning Pyrenees St Lary ticks all the boxes - pretty traditional resort, large varied ski area, fast modern lifts, good standard of accommodation and close to the airport which means transfer times are kept below 2 hours. St Lary is an old valley town linked to the ski area by a cable car and new 8 person telecabine. St Lary oozes alpine charm - narrow cobble streets, a wide selection of bars, shops and restaurants - some tucked away down alleys - facilities in the village also include a spa, swimming pool and cinema. An express bubble lifts whisks you up 900m each morning to St Lary Pla d'Adet. There is a wonderful beginners area just at the top of the cable car - a moving walkway will soon have beginners gaining the skills to glide, turn and stop. The ski schools are quick to exploit the whole area. One interesting ski fact about St Lary is that the whole ski area can be accessed by blue runs - this means that all standards of skier can explore the whole area. Beginners have 5 ski schools to chose from. Intermediates will have a ball in St Lary - long wide blue and red runs link each area and mountain. Explore Pla d'Adet from the new Bouleaux 6 man chair. Move on down the north face of Soum de Matte to St Lary Espiaube - take the bubble lift up to Col du Portet where you have a choice of descending down to Le Vallon or exploring the runs off La Soumaye. While not the largest ski area in Europe St Lary does offer an interesting alternative for more accomplished skiers. There are steep gnarly blacks, wide steep flat reds perfect for honing carving skills. Off piste is varied from wide open meadows to steep tree lined chutes.